This mod replaces every UI portrait pose with a static, neutral, slightly rotated one. simNopke-DRUIPoses-static-sims replaces the sim poses, while simNopke-DRUIPoses-static-pets replaces the pet ones. The portraits may not update immediately after you have installed the files. If you don't want to wait for a new look, change appearance of your Sims or pets by using a mirror. 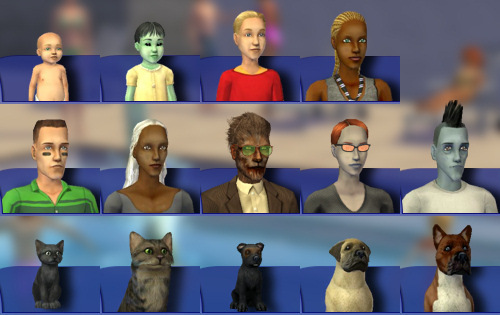 The portraits of dead Sims update only when their ghosts appear. Any other default replacement UI portrait poses, such as poses by Hexagonal Bypiramid which do conflict with simNopke-DRUIPoses-static-sims. I don't know if there are any default replacement pet poses. Nevertheless, they will conflict conflict with simNopke-DRUIPoses-static-pets.